With spring now knocking on winter’s door, visions of bright colors and flavors start sprinkling into my kitchen often with lemon as the chief culprit. Whether a twist of juice added to some yogurt, zest added to a creamy lemon posset (coming soon!) or whole lemons stuffed in a roasted chicken, it is as diverse as it is tart. 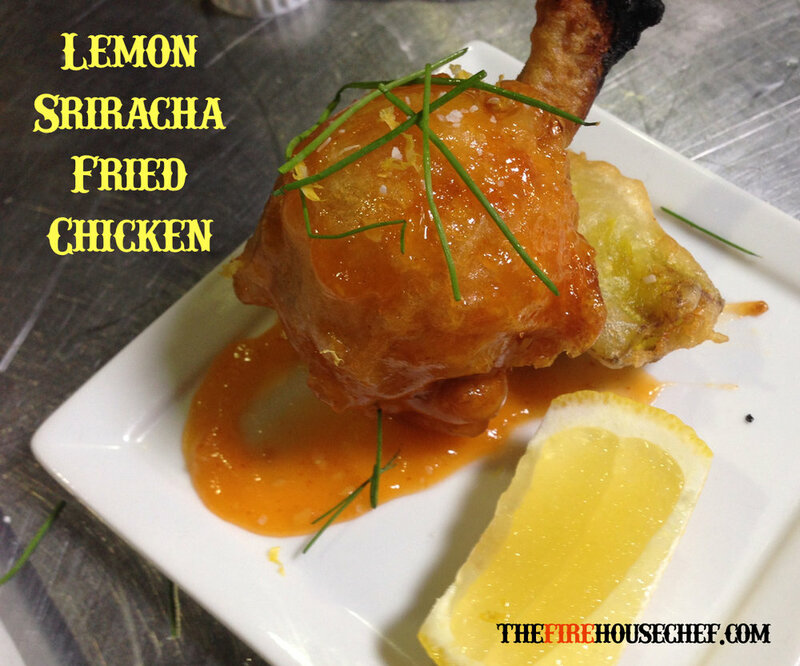 With that, I centered a recipe around the flavors of lemon highlighting both it’s sweet and tart attributes with the warmth and spice of Sriracha to formulate a sticky sauce that pairs well with chicken. As a transplanted west-coaster living in the south, I quickly found that I needed to arm myself with a good if not great fried chicken recipe. I have tinkered with many a rendition from tempura style to adding cornflakes and everything in between. One wonders if they will ever really perfect it but this is one that I am proud off. A few after the fire critiques: The first incarnation of the recipe was with wings so know that the sauce is dynamite on them as well. I’d suggest a shorter fry time and then finishing them off under a broiler until just right. Obviously this is a recipe for home with the addition of beer, however, if you want to share this special meal with the lads at the firehouse, simply remove the beer and go full seltzer. Lastly, with all things fried, cooking times vary with the size of the pieces so use a thermometer to remove the guessing game. In the saucepan over medium-high heat, heat the EVOO for 30 seconds. Add the garlic and cook for 30-60 seconds or until fragrant. While whisking, add the lemon curd, lemon juice and water and bring to a boil. Remove from the heat and add the Sriracha and cracked pepper, reserve over very low heat. In a bowl, whisk both flours with the cornstarch. Add the seltzer, beer, and salt (1 tsp. ), then whisk until smooth (it should resemble pancake batter). Add the chicken to the batter and turn to coat all sides. Heat 2-3 inches worth of the vegetable oil over medium-high heat until it reaches 350°F (use of a thermometer is suggested). Meanwhile, remove the excess batter from the chicken before frying. Then, working in batches, fry the chicken (slowly wave the chicken into the oil tempura style) for 3 minutes, or until it is starting to turn golden on all sides. Salt then drain in a wire rack for 10-15 minutes. Return the oil to 375°F and re-fry the chicken until a deep mahogany color is reached (or an instant read thermometer reaches 165°F in the thickest part), about 5-8 minutes. Momentarily drain the chicken on the rack and salt again. Transfer the lemon mixture into a large bowl. Gently toss the chicken in the lemon curd sauce, sprinkle with the chives, and then serve immediately.